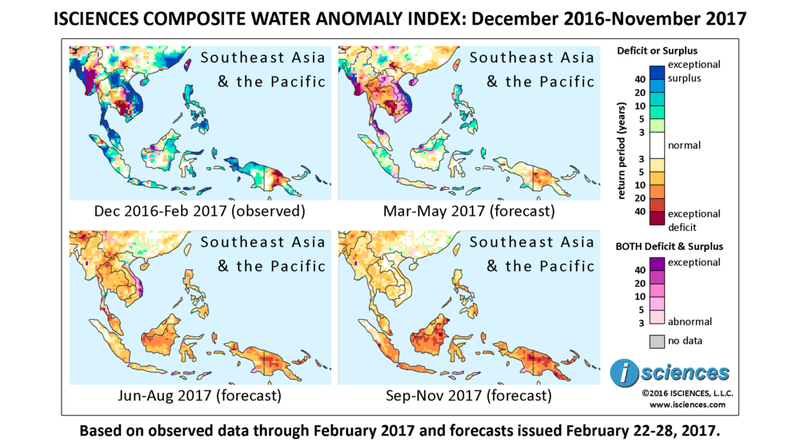 As seen in the 12-month map (below), moderate to extreme water deficits are forecast for Thailand, Cambodia, Indonesian Borneo, and Papua New Guinea. Moderate deficits are forecast for Myanmar, southern Sumatra, western Java, Sulawesi, and Papua, Indonesia. Surpluses are forecast for southern Thailand, central Vietnam, and Timor-Leste. Farmers in central Thailand's Chai Nat province have been advised by the local irrigation office to forego planting a third round of rice as drought in the region has dried up canals. The above-dam water level in mid-March at Chao Phraya Dam measured 29 centimeters below (~11.5 inches) standard operating level, leaving the river low enough to wade across in some areas downstream. The directive was issued to provincial officials nation-wide by the Secretary of the Interior and included the recommendation to wait until May before resuming farming or face legal repercussions. Water shortages in Uthai Thani province have already necessitated military dispatch of water trucks to provide drinking water. Some villages in the Irrawaddy Delta in Myanmar have also been facing drinking water shortages due to drought, and water-tankers have been brought in to alleviate the situation for the short-term. Water scarcity could affect 500 villages in the country this dry season according to Myanmar's Department of Rural Development, and plans are underway to distribute 14 million gallons of water if necessary. Heavy downpours caused several rivers to overflow in Indonesia's West Sumatra Province, creating flooding and landslides that killed 6 people, displaced thousands, and left 15,000 without power. Floodwaters reached 1.5 meters (4.9 feet) in some areas. A state of emergency was declared in Lamitan, Philippines as flooding hit the city. More than 3,000 families were evacuated and 100 homes destroyed. Over 11,000 people were displaced in Lamitan City and Tambulig municipality. Crop damage was estimated at P10 million (US$199,184). The 3-month maps (below) show the evolving conditions in more detail. As blues and greens in the top two maps give way to yellows and oranges in the bottom two, we can see a progression from surplus to deficit conditions. For the next three months – March through May – severe to exceptional deficits are forecast to persist in Cambodia, particularly in the west, and severe to extreme deficits will emerge throughout much of Thailand, creating conditions of both deficit and surplus as southern Thailand transitions from surplus to deficit. Deficits are also forecast for southern Myanmar and Papua New Guinea ranging from moderate to pockets of exceptional intensity. Both deficits and surpluses are forecast in Laos during this period and in Vietnam, though surpluses will dominate Vietnam’s central coast. Surpluses are also forecast for the Philippines, North Sulawesi (Indonesia), and Timor-Leste. The June through August map shows the absence of surplus as the region transitions to deficit conditions of varying intensity. Only Vietnam will remain in transition with both deficits and surpluses in central regions, basically normal conditions in the far north, and moderate deficits elsewhere. Moderate to extreme deficits are forecast for the rest of Southeast Asia and the Pacific, but are expected to be most intense in Papua New Guinea and Indonesian Borneo. The forecast for the latter three months – September through November – indicates that deficits may become less extensive in Southeast Asia, and more intense in Malaysia, Indonesia, and Papua New Guinea.